Nabeel R Obeid, MD, Heekoung Youn, MA, RN, Marina Kurian, MD, Christine Ren-Fielding, MD, George Fielding, MD, Bradley Schwack, MD. Department of Surgery, New York University Medical Center, New York, NY. The prevalence of cholelithiasis has been shown to correlate with obesity and BMI. Not infrequently, patients will present for bariatric surgery with symptomatic cholelithiasis. For patients electing laparoscopic adjustable gastric banding (LAGB), there is a theoretical concern that performing a concurrent cholecystectomy could cross-contaminate the implanted foreign body. The primary goal of this study is to address the safety and feasibility of this practice. A retrospective cohort study was designed from a prospectively-collected database at a single institution. All operations were performed by any one of four surgeons (GF, CR, MK, BS). All patients undergoing LAGB between July 2005 and April 2013 were considered for the study. LAGB was performed with or without a hiatal hernia repair (HHR) per group practice. Inclusion criteria consisted of age ≥ 18 and BMI ≥ 35. Exclusion criteria included patients with any other procedure performed at the time of LAGB or revisional bariatric surgery. 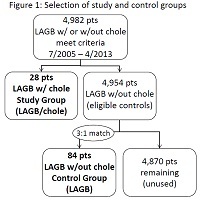 Patients undergoing LAGB with concurrent cholecystectomy (for documented symptomatic cholelithiasis) were included in the study group (LAGB/chole). The control group (LAGB) consisted of patients undergoing LAGB without cholecystectomy, and was selected using a 3:1 (control:study) case-match based on demographic and comorbidity data. The primary outcome was overall complication rate, with secondary outcomes including operating room (OR) time, length of stay (LOS), 30-day readmission and reoperation, band erosion, port/wound/intra-abdominal infections, and band/port revisional surgery. Statistical analyses were performed using two-sample t-test for continuous data and Chi-square or Fisher’s Exact tests for categorical data. There were 4,982 patients who met the study criteria. Of these, 28 patients had a LAGB with concurrent cholecystectomy and comprised the LAGB/chole (study) group. The remaining 4,954 patients were eligible controls, of which 84 were selected for the LAGB (control) group [Figure 1]. Demographic and comorbidity data were similar between the two groups [Table 1]. Mean follow-up time for the LAGB/chole group was 3.0 years vs. 3.6 years for the LAGB group (p=0.179). OR time was longer in the LAGB/chole group (68.7 min vs. 46.0 min, p=<0.0001), but LOS was the same (1-day admission: LAGB/chole 79% vs LAGB 85%, p=0.380). The complication rates are summarized in Table 2. 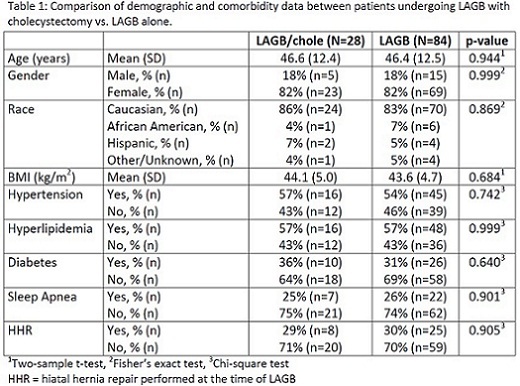 The number of patients with any complication in the LAGB/chole group was 6 (21%) vs. 17 (20%) in the LAGB group (p=0.893). Thirty-day readmission and reoperation were similar. There was also no difference in port site, wound, and intra-abdominal infections. 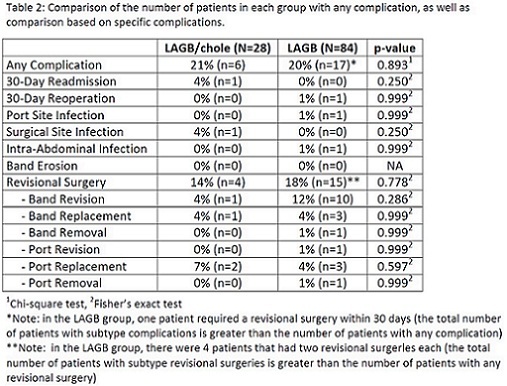 The rate of band or port revisional surgery was 14% in the LAGB/chole group vs. 18% in the LAGB group (p=0.778). There were no band erosions in either group. Our study suggests that performing a concurrent cholecystectomy at the time of LAGB does not result in increased immediate or delayed morbidity. While the operation may take longer to perform, it can be done safely and would avoid a second surgery for a patient already diagnosed with symptomatic cholelithiasis.